Industry News | CD EXPERTS, INC.
CD Experts, Inc. wishes to express congratulations and continued success to a previous client, now signed with Columbia Records. The Canadian Group, ‘Walk Off The Earth,’ has seen some great success, in part, launched by a unique YouTube video that went viral. Below is a press release from their signing with Columbia. (New York, NY – Feb. 1, 2012) Columbia Records is pleased to announce that it has signed the well-known indie band Walk Off The Earth, whose current YouTube video, a five-person, one guitar cover of “Somebody That I Used to Know,” has racked up 50 million views on YouTube in less than a month. The powerful fan response to the video has turned the five-year-old Canadian group into a media phenomenon and propelled them onto American network television, where a posted video of their appearance on The Ellen Degeneres Show received a half-million views in less than a week. In fact, their cover saw the highest Billboard debut since April 2011, blasting onto the charts at #14 with over 60,000 singles sold to date. The viral effect has been international as well – the song hit #1 on iTunes in Canada, as well as in Sweden and Germany. The band has already gotten thumbs-up from an impressive roster of show business veterans, including actor Russell Crowe, Coldplay, Mumford and Sons, Wiz Khalifa (they covered his song “Roll Up”), Justin Timberlake, Ryan Seacrest and Adele. Their version of her hit “Someone Like You” has had 3 million YouTube views. WOTE’s presence on Facebook has grown exponentially as well since the video was first posted on Jan. 5. They now have 300,000 people who “like” them – an 85 percent jump in just three weeks ; in addition, their page on Wikipedia has been averaging 10,000 page views a day. Gotye featuring Kimbra’s original video for “Somebody That I Used to Know” was an internet sensation on its own before Walk Off The Earth’s Gianni Luminati decided it was a perfect song for his band members, known for their creative remakes of current songs. 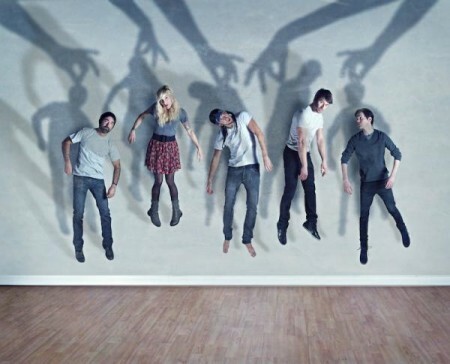 (After seeing the Walk Off The Earth version, Gotye tweeted his approval, calling the new video “hilarious and brilliant.”) In the video, the five play the same guitar simultaneously as Ryan Marshall, Luminati and Sarah Blackwood trade off on vocals. The other band members are Joel Cassady on drums/percussion and Mike Taylor on keyboard. But the Burlington, Ontario-based Walk Off The Earth, as their loyal fans will attest, is hardly an overnight sensation. Together since 2006, the five accomplished performers have remade dozens of songs and recently self-released an album, My Rock, that features original material, including the first single, “These Times.” Their ability to take a familiar song and give it an innovative twist has made their YouTube channel a hit, with 280,000 subscribers and 80 million combined views of their videos of both originals and covers. It was Luminati – a musician since childhood who specializes in layering musical sounds and beat-boxing – who first envisioned the five group members playing the same guitar. Once he heard the Gotye tune “I knew right away it was the perfect song for the idea,” he recalls. “I started messing around with different parts seeing if it would work.” Once he realized it could be done, he asked his bandmates to learn their individual parts before attempting to make the video. Once reunited, he admits they had trouble getting all the pieces to fit together: “It was pretty frustrating.” And once they turned on the camera it took 30 takes until they finally succeeded at around 4 a.m., when Luminati uploaded the video to their YouTube channel. (“All of our videos are one cut because I don’t know how to edit,” he admits). The band is currently in the studio working on original material for their release on Columbia Records.